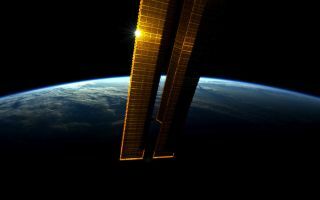 Astronaut Andre Kuipers took this image of solar panels glinting in space. The image was taken June 8, 2012. Astronaut Andre Kuipers took this image of solar panels glinting in space in this amazing space wallpaper. He wrote, "For days we've been flying along the border between night and day. Beautiful." The image was taken June 8, 2012.